Review: "Sweeney Todd: The Demon Barber of Fleet Street"
Audience members laughed and some may have felt the shiver of goose bumps on their arms as they watched the Music Department of Northeastern Illinois University (NEIU’s) production of “Sweeney Todd: The Demon Barber of Fleet Street.” Although movie-goers and Johnny Depp fans may be surprised to see that the musical does not follow the movie, the plot is soaked in revenge and tainted with the smell of meat pies. 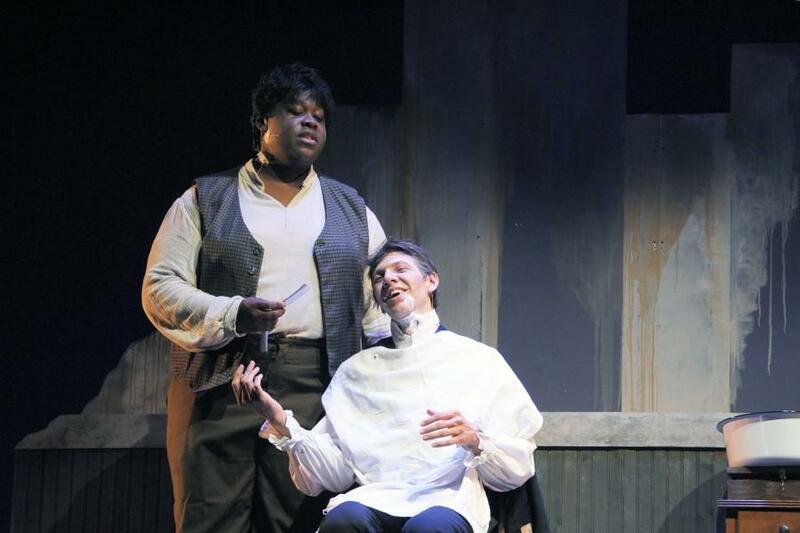 The opening scene began with a full cast of 80 people, the biggest cast that Music Department has seen on stage singing the “Ballad of Sweeney Todd.” Dark red lights and a high pitched screeching sound set a gloomy tone for the introduction of Sweeney Todd as a character. Sweeney was joined by a sailor named Anthony, whom he saved from drowning. While the two stood in the busy streets of London during the 19th century, Anthony noticed Sweeney’s dislike for the city and that’s when Sweeney sang a story called “the Barber and His Wife.” The two parted ways and Sweeney wandered down Fleet Street; there he met Mrs. Lovett and her pie shop. Mrs. Lovett quickly recognized him not as Sweeney Todd, but as Benjamin Barker and informed him that his wife died and his daughter was a ward of Judge Turpin. Mrs. Lovett gave Sweeney back his old shaving razors and convinced him to become a barber again. Fueled by rage and revenge, Sweeney accepted his razors. Sweeney out performed a street vendor and his bogus hair growth elixir .This attracted the attention of Judge Turpin and his right hand man, Beadle. While Sweeney tried to impatiently wait for Judge Turpin’s arrival, Anthony saw and immediately fell in love with Judge Turpin’s ward ( and Sweeney’s daughter), Johanna. Judge Turpin caught the two talking and immediately felt threatened. Beadle suggested that Judge Turpin go visit Sweeney for a clean shave in hopes that it would make Johanna like him and want to marry him. Judge Turpin went to Sweeney’s parlor and explained his reasons for wanting a clean shave, to attract a pretty woman. The two began singing “Pretty Women” and just as Sweeney was about to drag his razor across Judge Turpin’s throat, Anthony came rushing in. Judge Turpin is angered that Anthony is there and he immediately left the parlor. Enraged, Sweeney threw Anthony out of the parlor but that’s when Mrs. Lovett came in and suggested that the two combine forces. With 80 people in the cast and 31 musicians in the orchestra, Director and NEIU music professor, Sasha Gerritson said the show was so big that it had six roles double casted. “I liked the interesting, although dark, story and it had a lot of parts. That fact is always really important to me. I want to give as many students as possible a chance to participate,” said Gerritson. Although the show was received with a standing ovation, Gerritson said that some of the more challenging parts of this production were directing all the deaths at the end scene because of the mechanics of the drop chair they used.